Want to try something new and stylish? Then why not choose short braids like these! 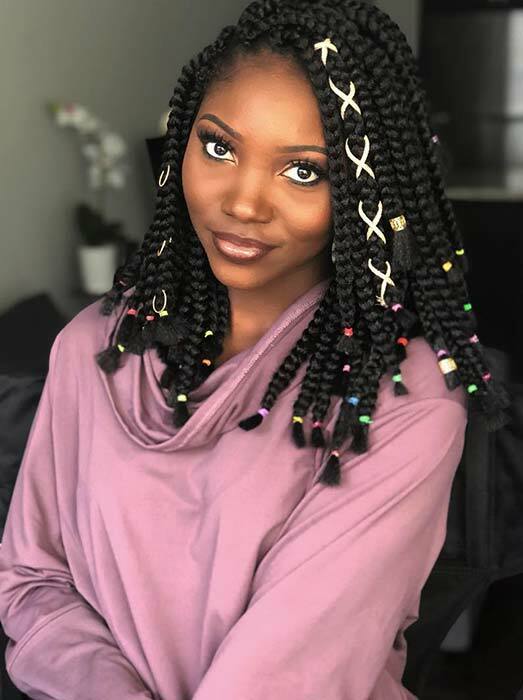 For this hairstyle, the hair is styled into jumbo box braids where one half of the braids are black and the other half are a dark burgundy shade. By using a bold color on only half of the braids, it creates a unique and trendsetting look – perfect for spring and summer. You can recreate this or you can use any colors of your choice. Our next idea is another easy to wear and chic bob. 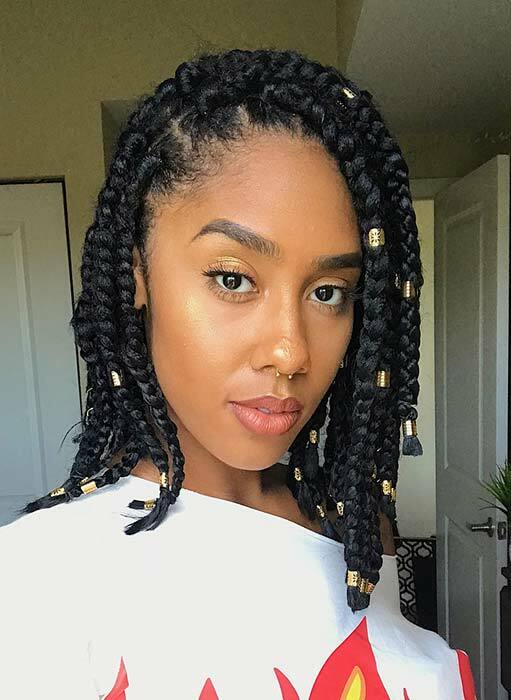 Here we have chunky box braids that have a side part and a length that goes just past the shoulders. Each of the braids is finished off with a gold hair cuff. A bob like this will suit everyone and it will make you look glam for any occasion. Love the funky hair color ideas? Then you need to check out this next style. 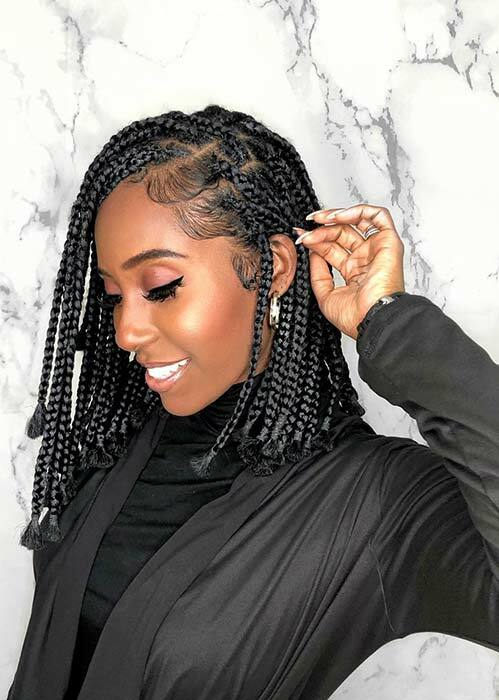 This long bob features box braids in two different colors. 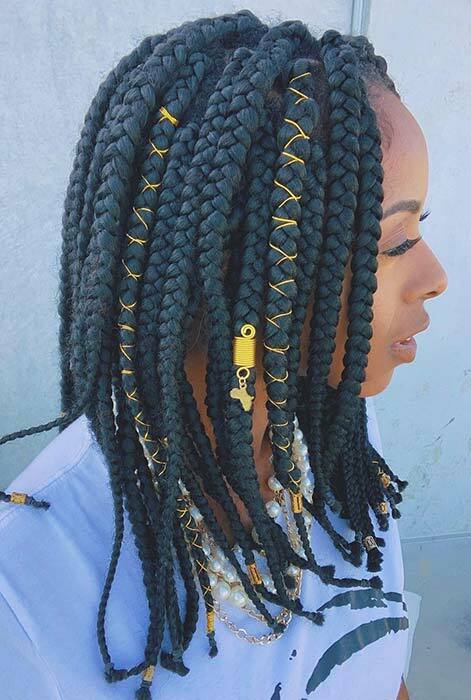 Some of the braids are black and the others a beautiful light brown shade. The color combination is gorgeous and they compliment each other perfectly. Recreate this look or try any color combo. Earlier in the post we shared a hair idea where half the hair was styled into a bun. If you loved that idea, then you may like this one too. This hairstyle features an elegant half updo. Half of the braids are loose and the other half are styled up. It is just a pretty and easy to wear hairstyle that will mix up your look. Next, we have another long bob that looks effortlessly stylish. 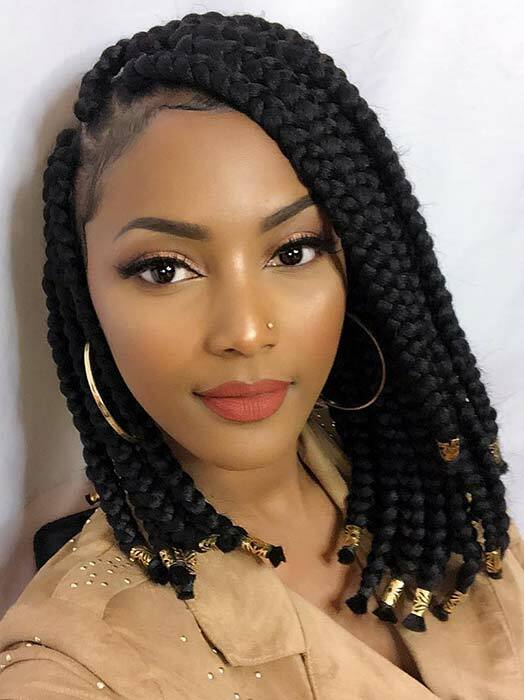 This hairstyle features classic box braids with a length that goes just past the shoulders. It is a beautiful hair idea that will suit everyone. Keep it simple like this or you can add accessories to jazz up the hair. You can also try a bold hair color for the upcoming warmer months. Want to glam up your look? Then a braided style like this is just what you need. 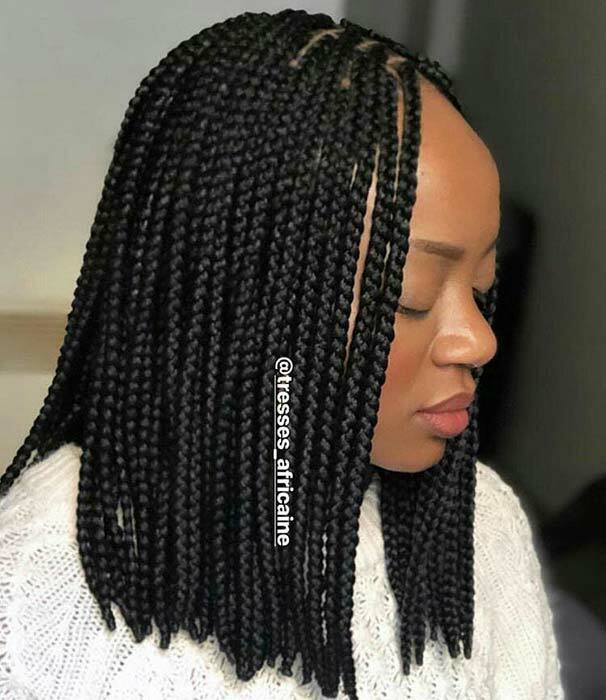 The hair is styled into beautiful box braids with a side part. Each braid is finished off with a gold hair cuff too. The actual hairstyle is quite simple but the gold cuffs really jazz it up and give it a chic look. Recreate this or add beads instead of hair cuffs. Our next hair idea is so trendy! For this look, the hair is styled into copper box braids with a center parting. We love the color used as it gives the finished hairstyle a cool and edgy look. Hair like this is perfect for someone who has been bored of their hair and wants to try something new. The next hairstyle we have to show you is perfect for those who love to accessorize! Here we have a long bob with jumbo box braids. The braids are finished off with cords, cuffs and a unique charm too. This is just an amazing example of the hairstyles that you can create with accessories. Try something similar to this or try adding your own beads, cuffs and cords to create your own stylish box braids. Love short bobs? Then you need to see this next style. 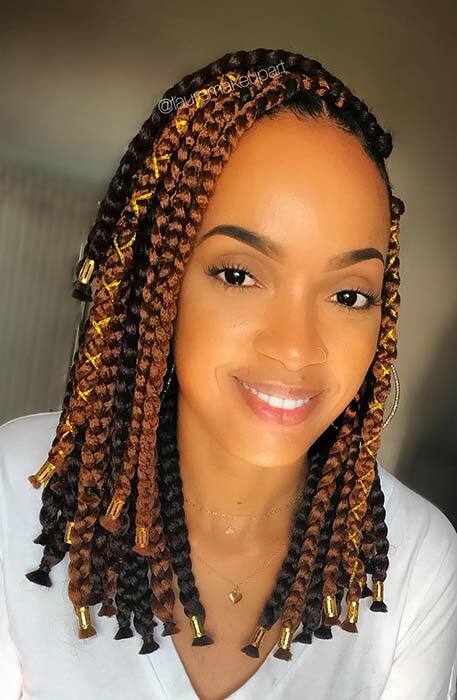 Here we have a box braid bob with a length that sits just below the chin. It is such a cute and trendy hairstyle! Recreate this bob for a simple look or try a similar bob in a different color to jazz up the style. A bob like this will look amazing on everyone. Next, we have another updo idea to share with you. 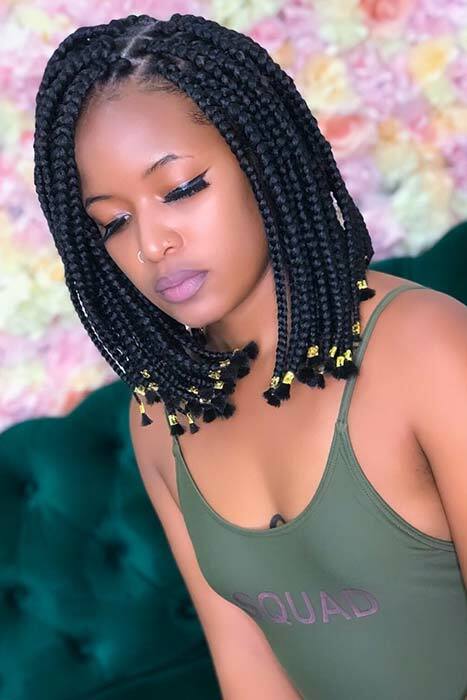 This box braid bob is another half style. Half the braids are loose and the other half are put up into two cute buns also known as space buns. 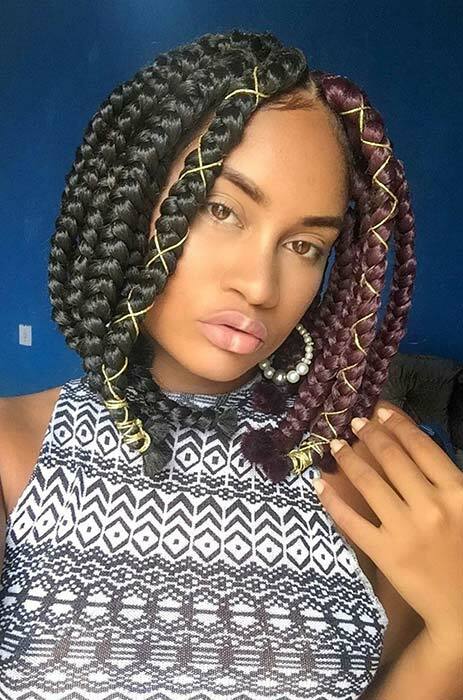 This is a pretty and unique hairstyle. Something like this will be perfect for the summer and for fun events like festivals. Looking for a bob that is simple but super chic? Then this is for you. 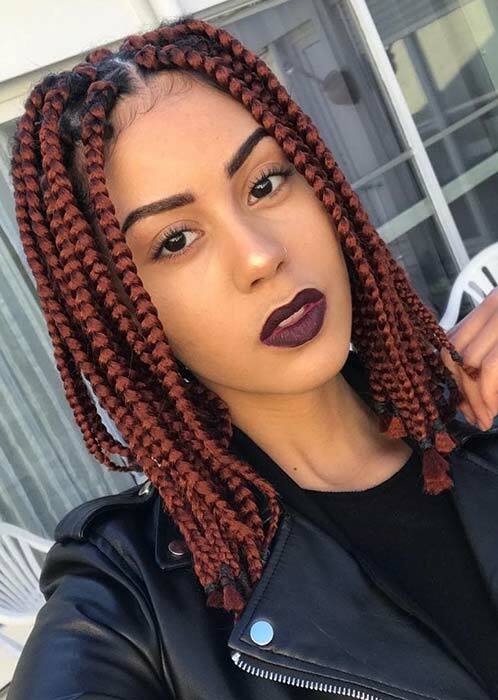 Here we have a short box braid bob. The bob is effortlessly stylish and it will give you a glam look everyday for any occasion. 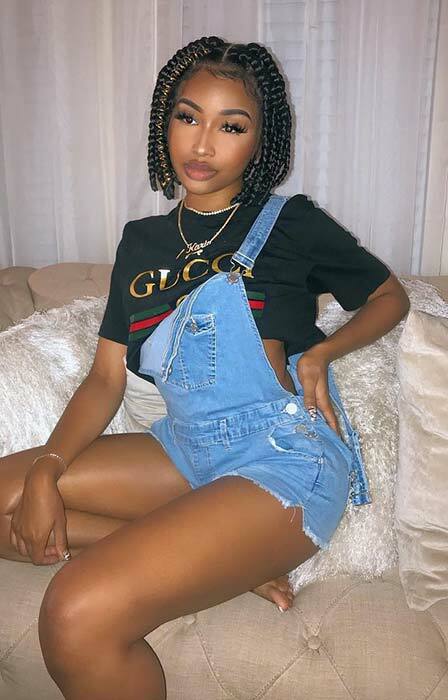 Recreate this or you can have similar braids with a shorter length. Either way, a bob like this will look stunning. Our next idea shows another trendy style that is accessorized with hair cuffs. This is a long bob with a side part and chunky braids. The bob is finished off with gold hair cuffs. As you can see, it is a cool and easy way to jazz up your hair. Recreate this or try a similar style with a different type of cuff. The last hair idea we have to show you is this unique and creative style. 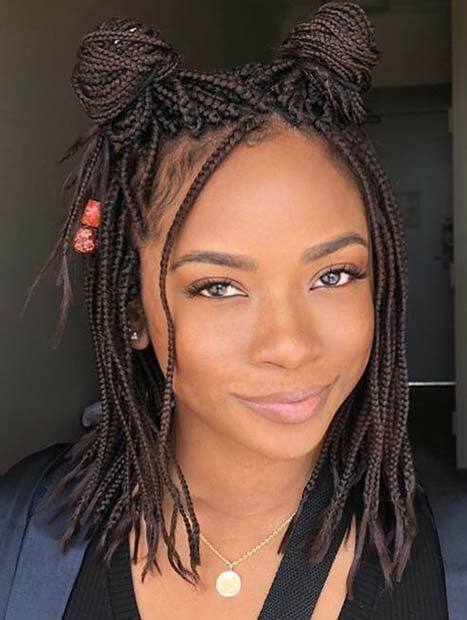 This is a long bob with chunky, crochet braids and it is beautifully styled with cords, colorful hair ties and hair cuffs. We love the different colored elastics because it gives the hairstyle a bold look. It is an easy way to bring your personality to your hair. Try a braided style like this or use elastic hair ties in your favorite color. 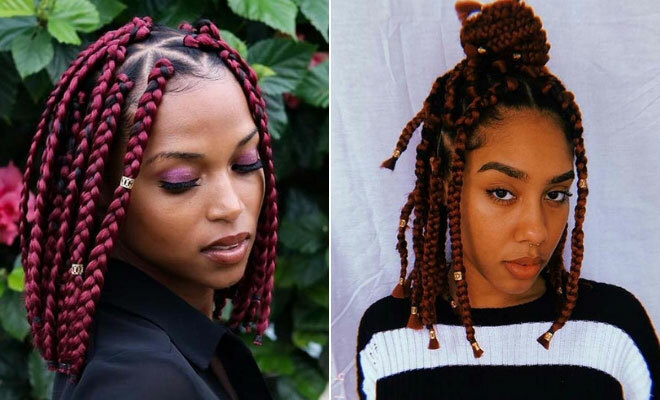 We hope you have found a short braided hairstyle to try! 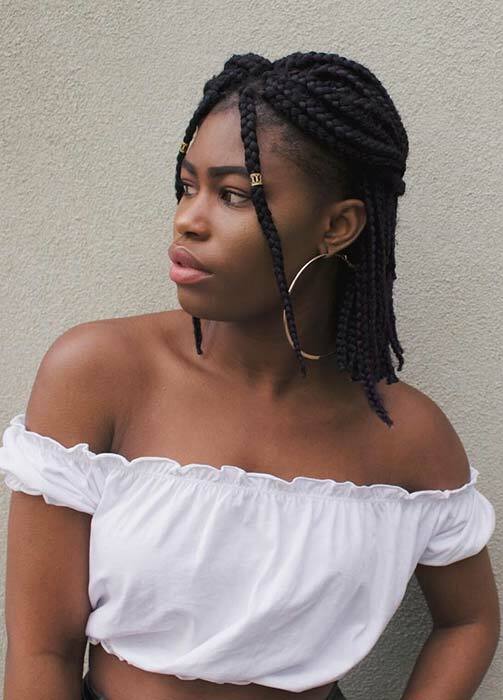 For more short braided looks, make sure to check out our other article here.